Some days, Kristal Nemeroff needs her wheelchair, but usually her walker suffices. She is slower than the students who buzz around her, but her motivation is in overdrive. At 27, Kristal is the nurse at Hamilton Elementary School in rural Pennsylvania, a few miles from where she grew up. Securing the job and completing her nursing certificate required fortitude and determination in a profession that she (and many others) once thought was off-limits to people with disabilities. "Rules and bones are meant to be broken," she wrote in Scrubs magazine chronicling her challenging journey. The quote has deeper meaning for Kristal, who has endured a lifelong battle with osteogenesis imperfecta, commonly known as brittle bone disease, a genetic disorder that affects the protein collagen found in bones, teeth, skin, tendons, and parts of the eye. She has endured 10 major surgeries, 25 broken bones, and months of immobility. For most of her life, Kristal has participated in research at the Eunice Kennedy Shriver National Institute of Child Health and Human Development (NICHD) aimed at improving the management of her condition. She credits the Americans with Disabilities Act (ADA) - which marks its 25th anniversary this month - for paving the way to her career. "It's so cool to be a role model," she says. "The ADA protected my rights and now I'm making sure my students know that, whether they have a disability or a disease, they should follow their dreams." The ADA, passed by Congress in 1990, created a culture of acceptance and inclusion for people with disabilities. This groundbreaking law also helped to establish a research arm at NICHD, called the National Center for Medical Rehabilitation Research, that funds scientific projects aimed at enhancing the health, productivity, independence, and quality of life of people with disabilities. During the past two decades, this center has advanced our understanding of effective rehabilitation therapies, assistive devices, and technologies. The center has funded sophisticated software that enables people with paralysis to communicate through computers simply with their thoughts. It also has fostered development of neuroimaging techniques that allow researchers to pinpoint the parts of the brain that control various functions, making it possible to monitor the effectiveness of therapies in people with traumatic brain injuries (TBIs). The center's director, Dr. Alison Cernich, is a board-certified neuropsychologist known for her work with TBIs and computerized neuropsychological assessment. "We've come a long way since the passage of the ADA," Cernich said. "The federal resources that have gone into empowering individuals with disabilities to enable them to fully participate in society have been transformative." Since passage of the ADA, a new generation of people with disabilities is more able to use public transportation, have access to government and other buildings, to enjoy national parks, and to cross busy streets safely. The law continues to have impact, offering not only independence and accessibility, but interdependence and a supportive climate. "It's more than access and ramps and respect," said NICHD grantee Dr. James Cole Galloway. "[ADA] created an environment where everyone is valued and given the opportunity to flex their brain, their muscle, to dream." Galloway and his GoBabyGo! program at the University of Delaware rebuild low-tech toy cars to give kids with disabilities mobility and independence. One of those youngsters is 3-year-old Rayven, who was unable to move on her own until she got behind the wheel of a sparkling teal-blue "Frozen" car modified by Galloway's lab. "Now, even when she's not in the car, she's moving her legs and it's not involuntary, it's intentional," said her mom Ariel Hayes of Cleveland, Ohio. 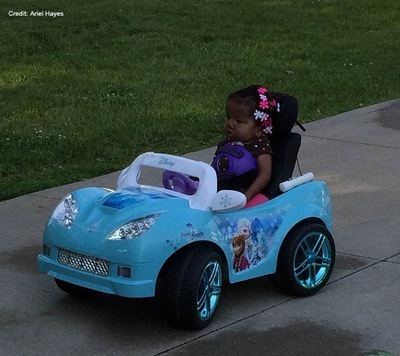 Rayven, who still only weighs 20 lbs., is unable to walk or talk, but she can move the car with the back of her head, which presses a button on the headrest. "She loves being able to make it stop and go." There's no doubt the ADA has helped improve mobility, independence, and accessibility for families with disabled children. It has also changed society's view of disabilities and of the full and productive lives that those with "diffabilities" can lead. But there still is much more to do to improve opportunities for those with disabilities, including continued research into the biological, environmental, and social factors affecting recovery and rehabilitation from disease or injury.